We want you to be clear about what to expect at TIPDI, so in this next bit, we’re going to give you the straight facts. Don't worry, we're super nice here at TIPDI, and we are not at all as dry as this page sounds. Keep reading for all the "nitty-gritty". The top half of this page gives you a sense of the schedule. The bottom half of this page helps you understand Levels, Placement, and Qualifications. 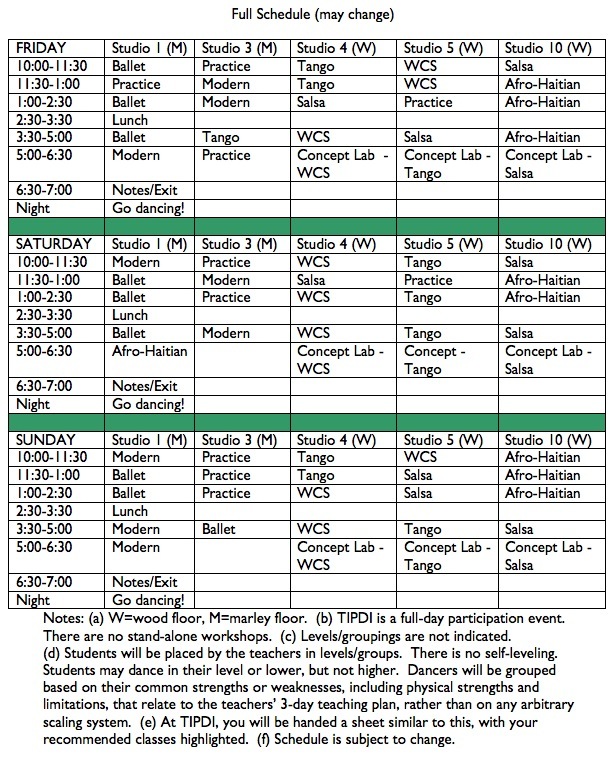 Generally speaking, your dancing day at TIPDI will consist of two 90-minute classes in your "primary" dance, plus three more 90-minute classes that rotate you among all the other dance forms! (See Schedule details below.) Every night, you'll have the chance to practice what you've learned social dancing in NYC. You will become amazing in a single 3-day weekend! At TIPDI, we highly recommend that you come for the full 3 Days, 4 Nights experience! However, we recognize that some folks can't get away until the weekend, so there's an option for you, too. Our full 3 Days, 4 Nights experience begins Thursday night with a Meet-and-Greet from 7–9 pm, followed by social dancing in New York City. On Friday, Saturday, and Sunday, you will plunge into TIPDI's amazing classes 10 am to 7 pm, with a lunch break, of course. That's 22.5 hours of classes with the world's top instructors! You will cross-train in every dance style, getting fresh new ideas and great new technique skills. You will become amazing! Classes on Friday will be especially wonderful - they will be small, with terrific opportunities for individual attention and personalized, in-depth instruction. The Weekend Experience (2 Days, 3 Nights) is for folks whose work obliges them to miss one of our days. For most of our Weekenders, that means missing Friday and attending Saturday and Sunday; however, you may pick any 2 of our 3 days. Your TIPDI experience will start in the evening with a brief check-in and meet-and-greet, followed by social dancing in NYC. Then you will have 2 full days (15 hours!) of TIPDI's amazing and dynamic classes, 10 am to 7 pm (with a lunch break, of course), followed by more social dancing each night! 9:00 pm Social Dancing in NYC! 8:00 pm - whenever Social Dancing in NYC! All classes are 90 minutes long. If you need a break, take one! We recommend staying in the studio and watching, because later classes build on the earlier ones. * Concept Lab is your chance to break out of old patterns and ruts. Instructors give you a dance “problem” to solve, and using everything you learned that day, you put it all together and create your own brilliant solutions, working in teams or pairs. The teachers are there to answer questions, help you out when your brain gets stuck, and provide feedback about what’s working and what is not. This is your chance to experiment and trip all over each other. We require a good, solid background in ONE of the dance forms that we offer, or a closely related dance. One dance is fine — we will teach you all the rest! To participate, you must have danced at least once or twice a week, for the last two years, in either Salsa, West Coast Swing, or Argentine Tango. * Or you have must have taken Ballet, Modern, or Ethnic dance classes at least twice a week for the last two years. * We do not expect anyone to have experience in all six dance forms (though it is crazy awesome if you do!). We simply ask that you have a reasonable degree of fluency in at least one of them. *If you have danced for fewer than two years but have trained intensively during that time — or if you have 2+ years experience in a different partner dance form — please contact us directly at info@tipdi.com, to discuss if TIPDI can help further your dance goals. Ballroom, Hustle, Lindy, Bal, Ceroc, and Blues dancers: please see our FAQ page, where most of your questions are answered in excruciating but charming detail. Group Red. There are no absolute beginner dancers at TIPDI, and consequently, there are no absolute beginner classes! Instead, our Red classes in each dance form will be "Very Accelerated Beginner for people who already can dance, but don't happen to know this particular dance." This is where nearly all of us will find ourselves for most of our classes, except in our primary dance form. Group Blue. Our Blue group in each dance form will probably consist of folks with a solid fluency. You have danced for 2 years and probably more; you know all the basics fluently; and you have a good repertoire of better-than-Basic moves and technique skills. You are looking to rapidly advance your overall dancing. You will love TIPDI. Group Green. Our Green group in each dance form will be pretty advanced. You are ready to advance your technique skills at the deepest level, and add lustre to your already extensive dance vocabulary. Just to give you a very rough idea: For WCS, currently half our enrollees are rated WSDC Intermediate and Advanced, and that's what we expect the Green WCS classes to look like. In Salsa, half our enrollees have been dancing for over 6 years, and that's probably what our Green Salsa classes will look like. In Tango, half our enrollees have been dancing over 8 years, and that's probably what our Green Tango classes will look like. Our experienced Ballet, Modern, and Afro-Haitian enrollees have been dancing an average of 6 years, at least 2x/week. Yes, TIPDI is going to have a rockin' bunch of fun and excellent people for you to mingle with! And here's the best part: everyone will also be pretty bad, er, new at most of what we do! We will place you in various groups very tentatively, based on the number of years you have danced in your primary dance form(s). After you arrive, our instructors will move you around, based on what they see the first day of classes. They will move you based on the particular things they intend to work on in the different classes, not on the basis of your overall skills. In general, everyone will be placed 1 level lower than they expect (because our overall level is so high), so please expect it!